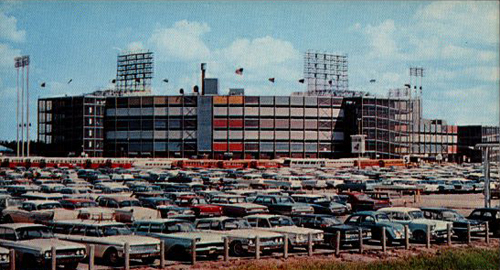 Metropolitan Stadium was built on a farm in 1956 for the American Association Minneapolis Millers. It originally consisted of a curved triple-decker grandstand that ran from first base to third base. The owner of the New York Giants (the parent team of the Millers) was quoted as saying that the Met "is the finest minor league park in the country, and there are not two in the majors that are better." In 1961, when the Washington Senators moved in and became the Twins, permanent bleachers were added along the left field line, a temporary bleacher was installed in left field and the first and second decks were extended down the right field line. The Vikings replaced the temporary left field bleacher with a double-decked left field pavilion in 1965. In 1982, the Twins and Vikings moved into the Metrodome in downtown Minneapolis. 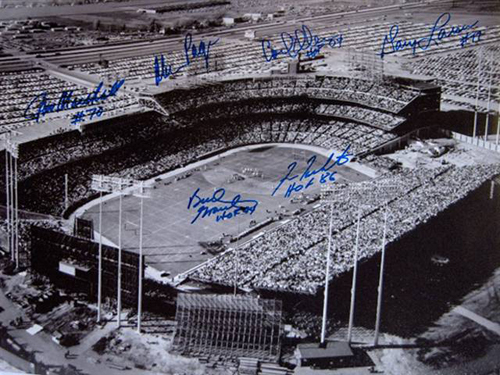 Metropolitan Stadium was demolished and the Mall of America now occupies the site. There is a plate marking the spot where the Met's home plate was in Camp Snoopy, a theme park in the Mall.